Passengers on a Scenic 'Tailormade' tour. The GPS-guided systems that allow guests to explore in their own time while travelling on Scenic ‘Space-Ships’ are providing over a 100 new sightseeing tours in 2014. After receiving their device on board, guests can choose to join Mozart for a historic walk through Vienna’s alleys or take a walk on the dark side of Würzburg on a witch tour. 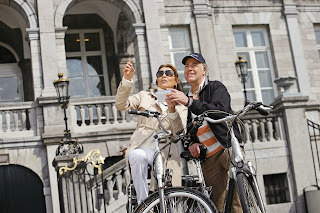 They can pedal through the orchards, meadows and lavender fields of Provence on electric bicycles; or discover the artistry of Europe on the ‘Van Gogh and Arts Trail’ through Arles and ‘Rembrandt Tour’ through seventeenth-century Amsterdam. Other tours include a Pustza horse show in a Hungarian village, lunch in a Czech winemaking town, the Chernobyl Museum in Kiev, Moscow’s State Tretyakov Gallery, and a tour of Vienna’s Seegrotte underground cave system. Guests visiting Hoorn will also enjoy a new experience in this northern Dutch city with residents showing some of the city’s most historical sights before opening their doors for a home-hosted dinner. Have you travelled with Scenic or used its 'Tailormade' GPS system? Why not share your experiences by commenting below.